If you live in Lexington or the surrounding area and need a trusted veterinarian to care for your pets – look no further. Your pets’ health and well being are very important to us, and we take every possible measure to give your animals the care they deserve. 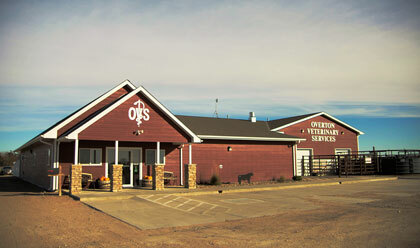 Overton Veterinary Services, LLC has been located in Overton, NE for 50 years and has provided valuable veterinary services to the community and surrounding areas. Why?? Simple. Because we live it. Because beyond all of our education ,training and experience we are we are pet parents first. Our veterinary practice also specializes in cow/calf production, back-grounding stocker cattle, feedlot consulting & production, and large animal nutritional services. The clinic also provides equine and small animal services. Overton Veterinary Services, LLC is a full service animal hospital and welcomes both emergency treatment cases as well as pet patients in need of routine medical, surgical, and dental care. We have years of experience treating serious conditions and offering regular pet wellness care. At Overton Veterinary Services, LLC our focus is on making trips to the vet a positive experience for everyone. We are happy to offer a number of resources that enable you to learn about how to take better care of your pets. Please feel free to browse our site, particularly the informational articles. The best veterinary care for animals is ongoing nutrition and problem prevention, so becoming knowledgeable about preventative pet care is essential to the ongoing success of your animal’s health. If you have any questions, call (308) 324-7202 or email us and we'll promptly get back to you. Our Lexington veterinarian office is very easy to get to -- and you can find directions on our Contact Us page! At Overton Veterinary Services, LLC, we treat your pets like the valued family members they are. A great article on Overton Veterinary Services and our synergistic way in which we build relationships and strive for herd health. "Staff was very helpful and attentive to my dog Buddy! Thank you for taking such good care of him! Thank you,"